Digital wireless system offers a mix of 24-bit digital audio quality and scalability to meet the demands of installed applications. 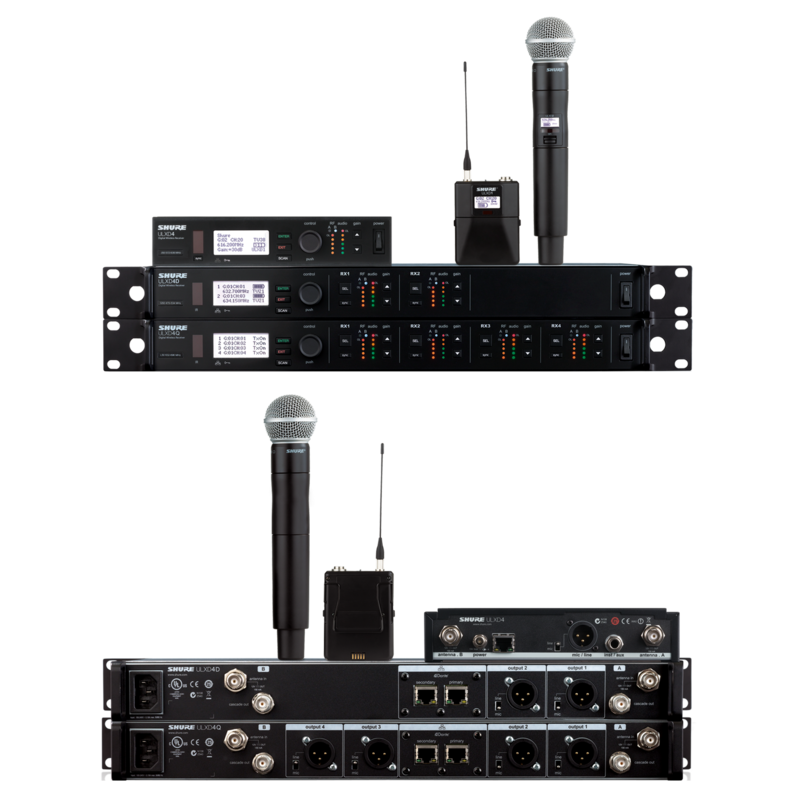 Digital wireless system offers a mix of 24-bit digital audio quality and scalability to meet the demands of installed applications. Features include Wireless Workbench 6, optimized frequency scanning, and AES 256 encryption for security. Operating in high density mode optimizes system to increase the number of useable frequencies. Different types of receivers offer different features and with it different levels of flexibility. Shure digital processing enables ULX-D to deliver pure, clear, and accurate reproduction of source material. An extended 20 Hz – 20 KHz frequency range with totally flat response, combined with 24 bit / 48 kHz digital audio, captures every detail with clarity and presence, plus an incredibly accurate low end and transient response. A wide dynamic range of over 120 dB offers excellent signal to noise performance. Proprietary Shure Gain Ranging optimises the system’s dynamic range for any level of input source, eliminating the need for transmitter gain adjustments. Which components does the ULX-D comprise? Ethernet networking allows for streamlined setup across multiple receivers. Bodypack Frequency Diversity safeguards against loss of audio signal, whether caused by RF interference or by power loss in a transmitter, to ensure uninterrupted audio for mission critical applications. The same audio source is sent from two transmitters with different radio frequencies. If problems occur with the reception of one frequency, ULX-D dual and quad receivers continue to provide flawless audio by automatically switching to the clean frequency. Switching between channels occurs in milliseconds, without any perceivable interruption for users. ULXD1 Wireless Bodypack Transmitter: The ULXD1 is compatible with a selection of Shure lavalier, headset, and clip-on instrument microphones. ULXD2 Wireless Handheld Transmitter: To tailor sound for specific purposes, the ULXD2’s microphone cartridge is interchangeable with the full range of Shure dynamic and condenser cartridges, which offer a diverse set of sound characteristics and polar patterns. Wireless Workbench 6: The ULX-D is compatible with Wireless Workbench 6 software, for advanced frequency coordination, monitoring, and control. What third party systems is it compatible with? The ULX-D offers seamless integration with AMX and Crestron media control systems. What are the ULX-D’s wireless features? The ULX-D delivers class leading wireless channel efficiency (region dependent) and signal stability. Minimised intermodulation distortion allows significantly more transmitters to operate simultaneously on each channel. In standard mode, up to 22 transmitters can operate in an 8 MHz TV channel. However, all receivers offer High Density mode for applications where high channel counts are needed, greatly increasing the amount of simultaneous channels possible over one frequency band. In High Density mode, up to 63 active transmitters can operate in an 8 MHz TV channel, with no audio quality degradation. For ease of use, optimised scanning automatically finds, prioritises, and selects the cleanest frequencies available. Interference detection provides instant alerts if the system encounters interference. For applications where secure transmission is required, ULX-D offers Advanced Encryption Standard (AES) 256 bit encrypted signal for complete privacy. This helps to reduce RF interference by only allowing the encrypted signal through to the receiver. Advanced lithium ion battery technology provides an extended run time over alkaline batteries, up to 12 hours of continuous use, with detailed tracking of battery health status. Lithium ion chemistry and intelligent Shure battery circuitry results in rechargeable batteries with no memory effect, such that a complete discharge is never necessary to maintain battery health. Transmitters and receivers display remaining battery life in hours and minutes accurate to within 15 minutes.